Pink Castle Blog: Try Aurifil Thread for FREE This Weekend at Pink Castle Fabrics! Try Aurifil Thread for FREE This Weekend at Pink Castle Fabrics! 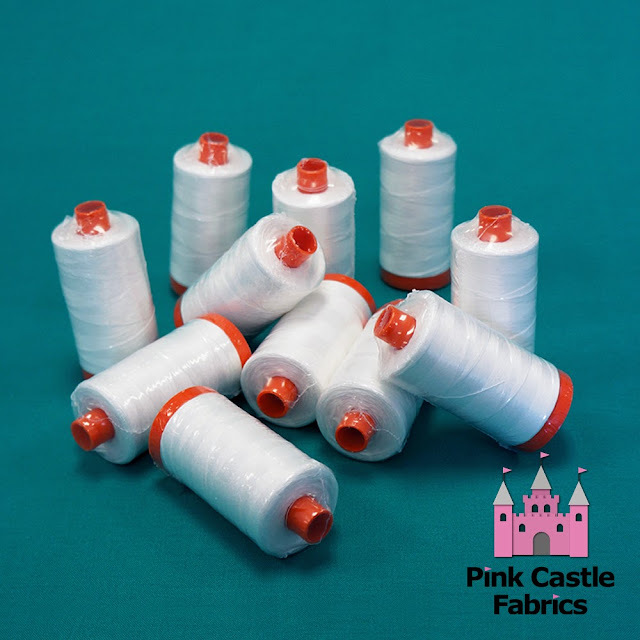 This weekend (October 10th- October 13th, 2013) get a FREE large spool of Aurifil #2021 white with all orders over $75 (before shipping) at Pink Castle Fabrics! No coupon code required! Have you tried Aurifil thread, yet? When I first started quilting, I had no idea that the thread you use made any difference at all. While talking with one of the ladies at my local quilt shop, she handed me a spool of Aurifil. "Use this." she said. "It's the best thread on the market." I did, I loved it, and I've never gone back. That was many years ago. Since then, I have learned a lot more about quilting and sewing and thread. I've learned that the thread you use DOES matter in sewing. You are going to spend hours and hours of time creating beautiful quilts. You want your hard work to last! This is why you buy quality fabrics and thread for your projects. What makes Aurifil so special? First of all, strength! Aurifil thread is made with extra-long staple Egyptian Mako cotton. Egyptian cotton is known for it's quality. The climate and soil there produces a plant with superior fibers. The cotton used to make Aurifil is extra-long staple. This means that longer pieces of fiber are woven together to make their thread. Imagine braiding your hair with only tiny short hairs. That braid is more likely to come apart than if you have long hair. Let's talk a little about thread weight. Aurifil has superior strength in a very fine thread. Aurifil comes in 252 colors in four different weights. I personally use the 50 weight (the thinnest) for all my quilt piecing on a machine and hand binding and English Paper Piecing. Your seams will lay flatter and you will have more accuracy in your seam allowance. I use either the 50 weight or the 40 weight for quilting. I prefer the 40 weight thread for quilting because it is a little thicker. I like to be able to see the quilting on my project. For times when I want the quilting thread to disappear, I use the 50 weight. I like the 12 weight for decorative top stitching on my machine and for hand embroidery. Bari J has a great post on using 12 weight Aurifil for embroidery! The amazing Pat Sloan has this great video on Aurifil thread weight. It's one thing for me to tell you all about it but quite another to actually get to SEE the difference! By the way, Pat is right, you need the Aurifil color card! The large spools have more thread than the other leading brands which make them an excellent value (in most cases, Aurifil costs less per meter than competitors!). The 50 weight thread comes with 1300 meters! It lasts me about a month, and I do a lot of sewing. Lastly, let's talk lint. Aurifil goes through a mercerization process. This process removes extra lint from the thread before it's dyed. This means less lint in your sewing machine! I still regularly clean my Bernina but there is a noticeable reduction in the amount of lint. But don't take MY word for it! Try some yourself! This weekend (October 10th- October 13th, 2013) I am giving you a FREE large spool (1300 meters) of the 50 weight Aurifil in white #2021 if you buy $75 (before shipping) at Pink Castle Fabrics! Over the next few months, we will be getting more and more Aurifil in stock at Pink Castle fabrics! I hope you love your free spool of Aurifil!